Remember when going for a Sunday morning coffee was leisurely and fun? When the biggest dilemma you had was choosing between a cappuccino and skinny latte? Remember when an impromptu stop at a coffee shop was a good opportunity to whip out your phone and catch up on texts, Facebook and Candy Crush? Remember when the biggest annoyance you had to encounter was getting hold of the Wi-Fi passcode, or the marshmallows were missing from your mochaccino? Not that I have much time to stop and reminisce these days, but I remember those distant days and smile. I think about the contrasting life I lead now and I smile some more. Well, it’s more of a chuckle really; recognition of a reality that we must laugh about, or else we might cry. It’s all Matt’s fault. He is a coffee-a-holic, a self-confessed Jeckal and Hyde coffee monster. He introduced me to his Sunday coffee ritual, and it soon became a customary part of the weekend. We would order our favourite beverage and a decadent slice of lemon drizzle, and sit and watch the world go by. After starting a family, we continued with our customary weekly coffee. Why shouldn’t we? It’s just a coffee, right? What can possibly go wrong? 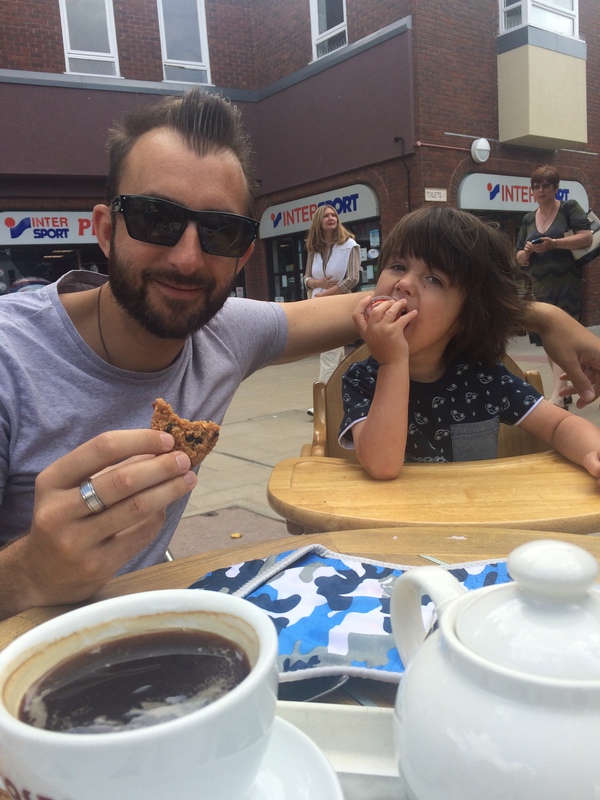 We had been determined from the minute that Jenson was born to continue with as much of ‘normal life’ as we possibly could, and we saw no reason that something as simple as a coffee outing could possibly be something to forsake. We soon learned of the risk of seemingly harmless objects that had in fact, been deliberately planted by The Enemy, to make our life hell. Take the balloon for example: fun for five minutes while it bobs up and down with the odd header thrown in by Dad. But introduce a sharp object, or worse, accidentally let it loose to float to the ceiling never to be retrieved again, and you would be forgiven for thinking the world was going to end. Or colouring packs. Do you really think my child, who is struggling to sit upright in his highchair and cannot hold his own spoon, wants to partake in painting-by-numbers? No, but he will happily throw the crayons into oncoming traffic, usually your paying customers. Just to be clear, we do not set out to intentionally ruin your beautiful coffee house, or repel your clientele. In hindsight, we really should have knocked it on the head and just invested in a really good coffee machine. But we persevered, foolishly. It might be because we are both unaccustomed to not succeeding with something if we really want it, particularly something as simple as a cuppa and cake. The first few weeks were bliss: In true new-born manner Jenson slept through our idyllic coffee liaisons, only to wake up on cue to gurgle at cooing strangers. This literally was a piece of cake! However, soon enough our caffeine bubble was burst. Jenson’s feeding problems were not compatible with sitting in a densely populated coffee house, and it was often hit-or-miss as to whether the outing would be a success or a disaster. We suffered many scorched mouths and frequent heartburn from having to gulp down and evacuate quick-smart! During our visits I became immune to the curious looks from strangers as I poured and mixed Jenson’s prescription formulas and meds. I grew a thicker skin in response to the perpetual comments along the lines of ‘someone’s not happy today’. I became accustomed to the shocked and disapproving glares when I would be physically restraining my baby to force a bottle into his mouth because only I, as his mother, knew that he was ravenous, despite his ferocious resistance to having the bottle anywhere near him. At this age, Jenson was only just starting to sit up in a highchair, assisted by cushions to prop him up. By the time we had stuffed him and the cushions into a satisfactory arrangement, he was generally bored, hungry or grumpy, and needed to cuddle back in our arms again. And as all parents know, sitting and holding a small and unpredictable child while attempting to drink a hot beverage is a recipe for disaster. While other babies were holding their own bottles and interacting with the world, Jenson was still recumbent in my arms for his milk, and still easily startled and troubled by his surroundings. Other babies were gobbling down baby foods; Jenson was still struggling to drink enough to keep hydrated. 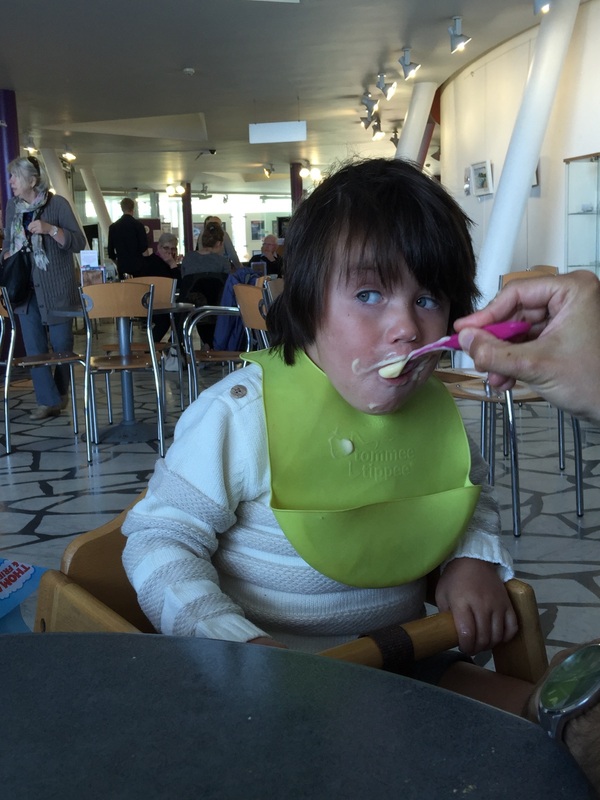 Being around other mums and babies was a stark reminder of the growing differences between my boy and his peers, and it was a scary and sobering experience, at this pre-diagnosed time of his life. My new found thick skin only went so far at insulating me from the curious and sometimes cruel attention we attracted. Jenson was still bottle feeding and his developmental differences were becoming harder to disguise. He would contemptuously throw food across the café as we were industriously trying to offer him baby snacks. He was not walking, but had become a world-record holder in bottom-shuffling. Sitting him on our laps, equipped with his favourite toy, was no longer an option. He wanted to explore the bin behind the food counter, the dirty napkin over in the far corner, the neighbouring lady’s handbag. It was like a game of human frogger every time the café door was opened, trying to keep him from being run over by oncoming patrons, in his quest to reach the Other Side. He insisted on being free and exploring; sitting in a high chair was an imposition he was not willing to endure and he was vociferous enough in his non-verbal language, to let the whole café know about it. We were venturing further afield to find suitable coffee outlets, where we were more likely to be absorbed and inconspicuous. Or places where the staff didn’t look at us and think ‘Oh goodness not that family again’. This one is simple. Having admitted defeat (see above), we abstained altogether. Bean-to-cup was a thing of the past. Matt was in mourning. We bought a coffee machine, but it was a poor substitute. We swooned longingly as we drove past Costa. Discount vouchers came in the post with the tag line ‘We’ve missed you’, sent with the simple purpose of taunting us further. We bided our time, patiently hoping that one day, coffee as we knew it would resume. Recently, we tentatively made the decision to re-attempt our coffee outing. To our absolute amazement, it was a success! It is early days but I hope I am not premature in saying that we have turned a corner! By equipping ourselves with a rather lengthy list of apparatus and essentials, we seem to be just about able to venture out for a coffee again. To be clear, this does still involve organising things to military precision. It is only through a tried and tested scientific approach that we carry out this exercise, although we are most definitely still in training mode. Finding a coffee shop with a very short queue and a very large table. His favourite yoghurt and at least four feeding spoons. Precision timing: Our visit needs to coincide with him being slightly hungry (but not yet to the point of meltdown) so that in T minus 10 minutes when his toys start to bore him, we can distract him with food. A bib designed by CERN to barricade the aforementioned slops of anti-matter yoghurt as they explode in all directions. An assembly of 12 stirring sticks for him to chew (then throw), 12 teaspoons to bash (then throw) and 12 sachets of sugar to shake (then throw). A musical toy that plays the most catchy, annoying tunes, guaranteed to stick in every customer’s head for the rest of the day, leaving them cursing us. Placing inanimate objects well out of reach other than ones that cannot do any harm or smash. Lightning-speed reflexes to intercept the trajectories of the flying jugs of frothy milk that we have forgotten to place out of reach. Our iPad housed in bomb-proof casing, and programmed with an assortment of kids’ games and cartoons. A large portion of humour and a spirit of light-heartedness are also desirable. Reading this back, I do find myself asking ‘Why do we bother?’ Why indeed! Perhaps because it is a minor victory for us, to retain an element of normality in our family’s increasingly atypical world. The irony is that I would bet we are the ones having the most fun out of all the coffee-consuming customers. I don’t mind admitting that three years ago, I would have taken one look at a family like us, and sat as far away from them as possible!